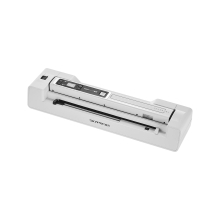 This portable scanner features high-speed & high resolution scanning, max. resolution up to 1200dpi when working with the base. Automatic paper feeding, provides higher performance and better user experience. Directly save JPG/PDF files to the memory card (not included). When working with the dock, long press the SCAN button and then you can see the scanned files in computer. Widely applicated in offices for scanning documents, pictures, contracts, certificates, invoice, etc. Resolution: Low: 300 * 300dpi ; Middle; 600 * 600dpi ; High: 900 * 900dpi. Scan Photo Size: A4, A5, 5R, 4R, 3R and down.